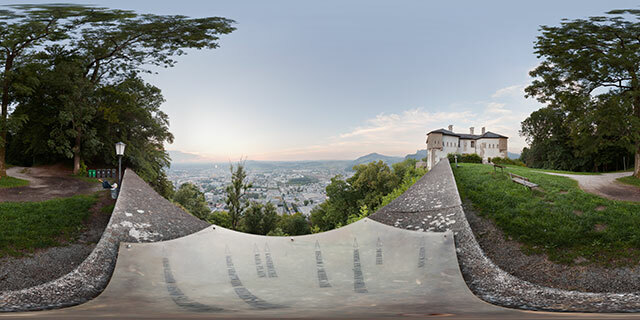 360° VR panorama from the top of Kapuzinerberg, in the Altstadt district of Salzburg, Austria. Kapuzinerberg is located on the eastern bank of the Salzach river, the view here looks out over the Schallmoos district of the city. Nearby at the top of the hill is the Franziskischlössl (meaning Francis′ Castle). It was built in 1629 by Archbishop Paris Lodron in order to improve the defences of Salzburg during the thirty years war (1618–1648).